As we’ve produced The Docker & Container Ecosystem ebook series, it feels like container usage has become more normalized. We talk less about the reasons why to use and adopt containers, and speak more to the challenges of more widespread container deployments. With each book in the series, we’ve focused more on not just moving container workloads into production environments, but keeping those systems healthy and operational. With the introduction of containers and microservices, monitoring solutions have to handle more ephemeral services and server instances than ever before. Not only are there more objects to manage, but they’re generating more pieces of information. Collecting data from environments composed of so many moving parts has become increasingly complex. Monitoring containerized applications and environments has also moved beyond just the operations team, or at the very least has opened up to more roles, as the DevOps movement encourages cross-team accountability. 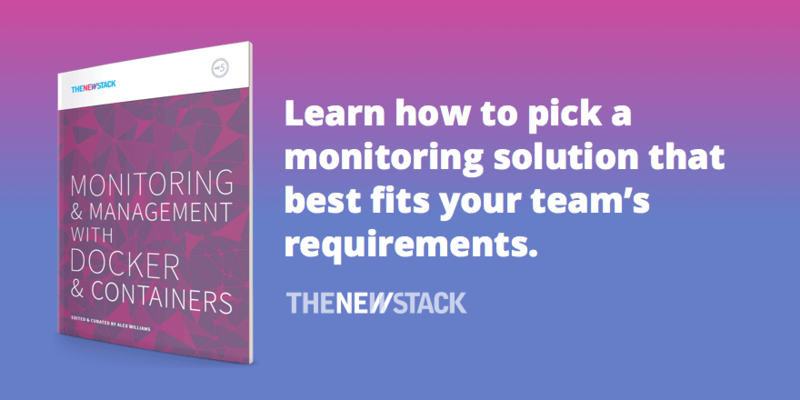 Released today, this new edition, volume five in our series, starts with a look at what monitoring applications and systems has typically meant for teams, and how the environments and goals have changed. Monitoring as a behavior has come a long way from just a task needed to keep computers online. While many of the core behaviors remain similar, there’s a lot that’s different with containers. Many of the defining characteristics of containers are what make them difficult to monitor. We discuss these differences, and how users and vendors are adapting to meet the necessities of containerized environments. Moving beyond historical context, we will tell you all about the components, behaviors, use cases and event types that compose container monitoring. There is a breakdown of the different approaches for measuring and handling events, including metrics, logs, profiling and tracing. This breakdown includes a discussion about metrics-based monitoring systems, and how the metrics approach constitutes a series of functions such as collection, ingestion, storage, processing, alerting and visualization. Another major focus of this book is how users are actually collecting the monitoring data from the containers they’re utilizing. For some, the data collection is as simple as the native capabilities built into the Docker engine. Docker’s base monitoring capabilities are almost like an agnostic platform for other tools that build off it. We cover some of the different tools for data collection, which range from self-hosted open source solutions to commercial cloud-based services that are built specifically for containers. We also discuss how users and teams can pick a monitoring solution that best fits their requirements. We cover how containerized applications and services can be designed with consideration for container-native patterns and the operations teams that will manage them. Creating applications that are operations-aware will enable faster deployment and better communication across teams. This focus means creating applications and services that are designed for fast startups, graceful shutdowns and the complexity of container management systems. Docker is an open platform for developers and system administrators to build, ship and run distributed applications. Docker is used by millions of developers across thousands of the world’s most innovative organizations, including eBay, Baidu, the BBC, Goldman Sachs, ING, Yelp and Spotify. Sysdig is the most powerful container-native monitoring and troubleshooting solution. Sysdig can see inside your containers without intrusive instrumentation. We natively integrate with the entire container ecosystem, giving you deep visibility into your applications and microservices. Much like the container ecosystem itself, the approaches to monitoring containers are varied and opinionated, but present many valuable opportunities. The monitoring landscape is full of solutions for many different types of environments and teams. These monitoring solutions include many open source and commercial solutions that range from native capabilities built into cloud platforms to cloud-based services purpose-built for containers. We try to cover as many of these monitoring perspectives as possible, including the very real possibilities of using more than one solution. While this book is the last in its series, this by no means our last publication on the container ecosystem. If anything, our perspective on how to approach this landscape has changed drastically — it seems almost impossible not to try and narrow down the container ecosystem into more approachable communities. If we’ve learned anything, it’s that this ecosystem is incredibly lush and growing at a rate that is difficult to consistently portray. As we refine our ecosystem perspective, we are looking to break it down into new areas of focus, such as Docker, Kubernetes and serverless technologies. Expect to see more from us on building and managing scale-out ecosystems. We’ve learned so much from this first ebook series on Docker and containers, and we hope you’ve learned a few things as well. I’d like to thank all our sponsors, writers and readers for how far we’ve come in the last year, and we’ll see you all again soon.